Interesting things can happen when one rides a colourful, flower-covered, glittery bicycle with tarot cards in the spokes. It gets photographed a lot, adults with small humans find themselves crouching down beside their little ones to point out its various wonders, it sometimes receives gifts (of both the lovely and not-so-lovely kind… mostly lovely! ), and its bling helps keep me visible on the roads. Last night (Monday February 20) something all together different happened. My lovely bicycle was vandalised! I got a text message at around 6:45pm from my client who had just left, saying that somebody was stealing the tarot cards from my bicycle wheels. I ran down, but he had already gone. Bystanders told me that a man had been ripping the tarot cards off my bike spokes, blundering around with them and accosting people to ask what the cards meant! He was described as a bald white man, “not all there”, wearing a white shirt and black Adidas shorts, who “looked a bit like Uncle Fester” (!) and had blood on his mouth! Eek. Hey you! Bring back my tarot cards! My client ordered him to put the cards back, and indeed he had returned a couple (the Knight of Cups and The Sun are now safe! ), but then he returned to ripping off more cards. Pressing the point with him was a obviously a difficult task given his unpredictable behaviour and the blood coming from his mouth. In the past, the cards I have had on my bicycle have been colour photocopies of tarot cards, which I then laminate and staple onto my bike spokes. But this time was different – when I asked Carrie Paris for permission to use photocopies of her Relative Tarot for the bicycle wheels, she most generously ended up sending me an actual deck across the Pacific Ocean specifically for this purpose! Wow! I had carefully covered the cards in archival plastic to protect them from the elements, so that they could be used once again for other divination purposes when they had had their time around the wheel. The Relative Tarot is a Major Arcana (22 cards) and Court Card (16 cards) deck, and it has two versions of both Justice and Strength, so that readers can use the numbers they personally prefer for Justice and Strength (8 or 11. Long story why this is so. Ask google or duckduckgo sometime if you are curious). So altogether there are 40 cards in the deck. I put these cards on with the intention of using them for Bicycle Divination Readings: I ask a community-oriented question of my bike, then ride to wherever I am going (usually my tarot office) and whatever cards are at the top of the wheel when I reach my destination provide the answers to the question. I then post the mini-reading on Instagram (search for the hashtag #bicycledivinationproject). Carrie and I had been talking about a future plan for what would happen next with the cards once they had finished their time on my bike, a plan which would see them being sent all over the world. While I am somewhat bummed that now the deck is no longer complete, I also understand that this odd desecration of my bicycle is all part of this divination experiment. Tarot cards often seem to have a life of their own, and now five of these cards are AWOL, off on another journey. With a bald white Uncle Fester type with a bloody mouth. So……. who are the missing five? The Knight of Wands, the Queen of Wands, The Moon, Death and one of the Strength cards (number 8. Number 11 is for now, safe). If you find them, please contact me! I would love for the cards to be reunited! But I also accept that this might be all part of the peculiar destiny of this bicycle deck. Time for a new deck on my wheels perhaps? They have been there since June 2016, so probably yes. Strangely enough, today I remembered that in the winter of last year I had had a bizarre and slightly frightening interaction with a bald white man who looked like Uncle Fester. It was after dark and I was riding my bicycle down a narrow back alley. As I reached the final 15 metres of the alley, this Uncle Fester suddenly stepped out from the shadows and went, “ARGHHHHHHH!! !” and reached out for me! Taken by surprise, I threw my arm up and yelled, “ARGHHHHH!” right back at him and then he kept on yelling and I kept on riding. I passed two cyclists coming towards me in the next alley and I shouted to them “Don’t go down the alley on the right!” and they yelled “Thanks!” and turned left. So perhaps this was the same bald white man??? No doubt there is a reading in here somewhere – I think a tarot reading using the five missing cards is called for (with perhaps a cameo from the two that were saved – thank you to my client who managed to save the Knight of Cups and The Sun!). Yes? Tomorrow (or the day after) I will do a Tarot Reading for the Missing Five (and the Saved Two). Stay tuned! 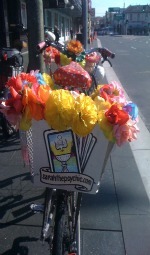 I had put new faux flowers on my bicycle that very morning. Clearly it was looking too fabulous for its own good! Oh Sarah I’m so glad you are safe and am sending calm to your clearly tormented attacker. Apparently the deck was ready to move on and I find it fascinating that your client took similar action as would the Knight of Wands and brought light (the Sun) back to the Queendom (that’s you!). Thank you for taking the Relative Tarot on such a fine adventure. It means the world to me.